make it perfect: .FAB FROCKS!. 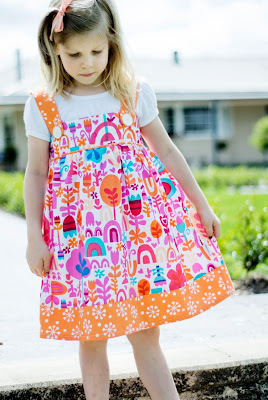 Introducing a new Make It Perfect pattern....FAB FROCKS! 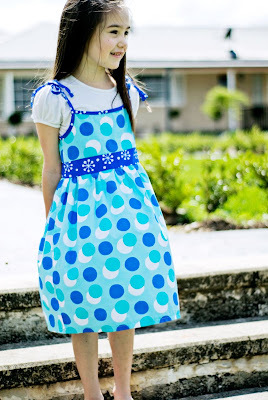 Fab Frocks are two stunning yet simple dresses for little girls who like to play in style. while the Party Girl Dress is made with thicker shoulder straps, secured with large buttons. Quick and simple to sew up, making a few of these in your favourite fabrics will be no hassle at all. Layer the dresses over a t-shirt or long sleeved top and tights to wear them all year long! You can easily turn The Swing Dress and Party Girl Dress into tunic tops by simply making the skirt a little shorter! Head over to the Make It Perfect website to see more photos and check out the fabric requirements for Fab Frocks. If you would like to purchase a copy of Fab Frocks for yourself, they should be popping up in retail stores very soon. Ask your favourite store to get one in for you! Thankyou once again to Eden Lane Photography for capturing these images so perfectly! Would you like to win a copy of Fab Frocks? Well, we better have a giveaway! Wow! I love them. You always create such beautiful patterns. Cute dresses! I love your fabric choices, too. 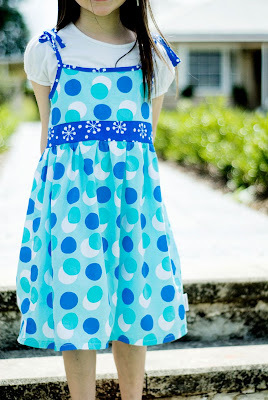 I have a four year old who only wears dresses and who would love for me to make one of these! Thanks for the chance! 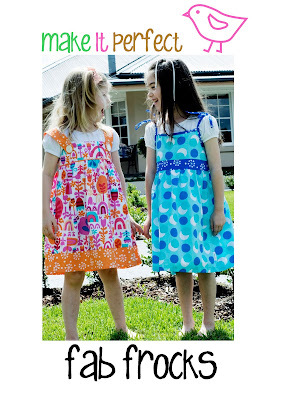 They are super cute dresses - so perfect for summer! You have outdone yourself, again Toni! These are absolutely gorgeous, can't wait to have a go at them. lovely! Your patterns are always so cute. Too sweet :) The girls would go ga-ga for some dresses like these! what lovely dresses! Looks like even a beginner like me could make those. I love the fabric choices too. So cute!! I can see Imogen wearing these in a few years. I blogged about it Tone! I wish you made patterns up a big higher! My Daughter is now a size 5-6... I found you too late! So Cute! Love the versatility, too! You're too clever! Love them! Hope I win! The fab frocks are, well, fab! I love these! Especially how two fabrics are incorporated in them. Thanks for offering this give away! Gorgeous! 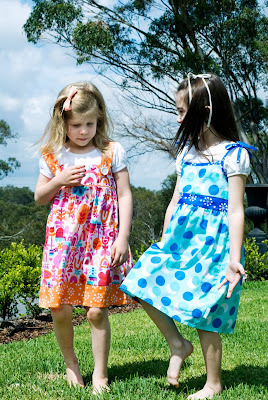 I two little girls of mine own and lots of nieces who would love to spin around it those dresses! great looking dress! i realy love the blue one! it looks prfect! Well, looks like I'll be broke again - I can never make just 1! !Gorgeous patterns Toni - amazing once again! 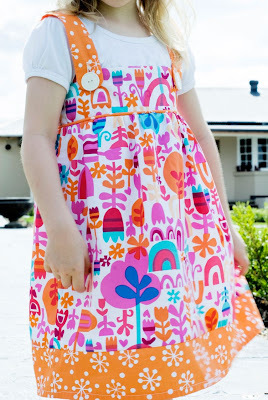 I loove these patterns ...they remind me of how easy it was to sew for my girls way back when!!!! !I am almost packed up and I have left out the sewing machine to go with me to the rental(plus i found some really cool retro materials all packed up and hidden in the top of the cupboard)..that will all go with me...so if you think i deserve to win a pattern i figure i could make those 4 little grandaughters of mine these dresses.... i will have time wont i???? Super cute pattern again Toni. Love the dresses. Another great design. Hello again Toni. I would love to win this pattern, I have a 15 month old granddaughter who would look lovely in this type of dress!! I have some lovely chambray fabric that will look great. Anyway, please put me in the draw!! These are really cute, I can't decide which one I like best. Another great pattern, i have at least 1/2 your patterns although, sewing is almost non existent since getting pregnant with number 3, sewing time has turned to sleeping time. I don't know how you do so much with your three.....My 2, soon to be 3 daughters love new dresses and i love your patterns so we would love to win this one! Oh wow! These are simply gorgeous...I can just picture my 4 year old in one of those lovely frocks!